Open Source Aquaponic Greenhouse from Open Source Ecology on Vimeo. The Open Source Ecology Aquaponics Workshop is a 6 day immersion experience where we build Open Source Ecology’s largest weeked construction project – an 800 square foot aquaponic greenhouse. The overall workshop is broken into two 3-day sessions, where participants can choose either or both. In the first workshop, we will build the greenhouse structure with polycarbonate double-wall glazing, with ponds and hydronic heating, at a cost of $4000 – or 3x lower than industry standards. In the second workshop – we will build the integrated biological modules for an integrated greenhouse with ecological pest management. This is another workshop where OSE is pioneering its Extreme Manufacturing approach of rapid building with multiple teams working in parallel on modular components. We are aiming for the most integrated, yet practical and affordable, greenhouse in the world. Grow beds for plants and fish: Plants are fed by the fish water. 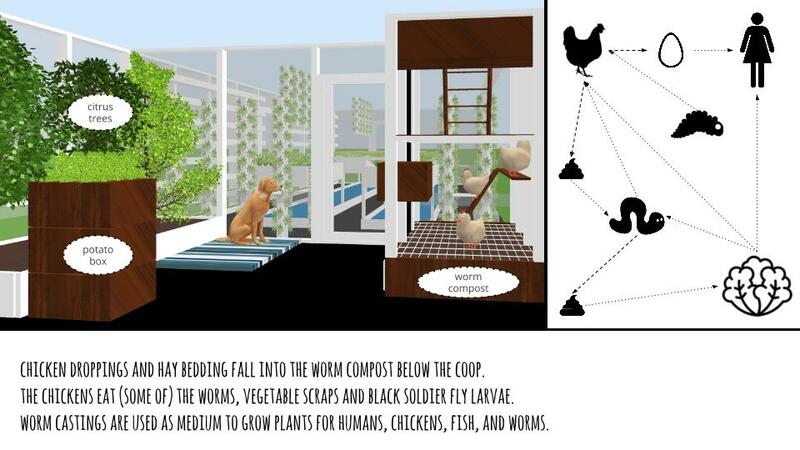 We will utilize sand beds, hanging towers with growing media, compost beds, and other growing tower systems. Strawberry gutters: Strawberries grow from ceiling-hung gutters, as a small fruit that can be grown effectively in aquaponics. Duckweed production: Duckweed is a primary producer low on the food chain, providing 3 kg of wet duckweed fish food per day from hanging troughs. Spirulina algae: A superfood that produces 10 grams of dry mass per day per square meter of growing area – our systems will produce about 100 grams of per day from the spirulina bioreactor. The bioreactor will consist of 3 square meters of water troughs and 7 more square meters equivalent from transparent panels hanging above. This is 300 calories and more that 100% of the recommended daily intake of protein for one person! Mushrooms: Oyster mushrooms are grown on straw in vertical towers consisting of stacked 5-gallon buckets. 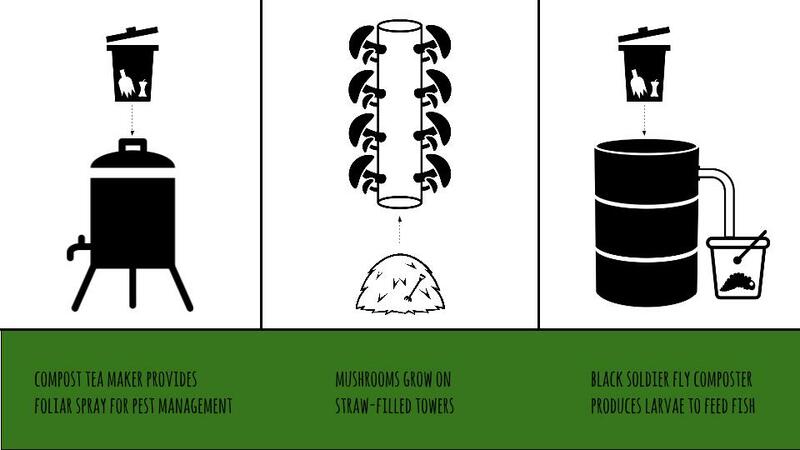 This produces 5 lb mushroooms per bucket or about 30 lb per tower per month – on a floor space of 1 square foot – so an average of 1 lb of mushrooms per day from 1 square foot! The CO2 produced by mushroom respiration enhaces plant growth in the greenhouse. If we have 4 towers, we have 4 lbs of mushrooms per day – 640 calories. Black soldier fly (BSF) larvae: Fed on kitchen scraps and offal from a local butcher shop, these can provide 5 lb of BSF larvae fish and chicken food per day from a footprint of only one square meter! That would make for about 3000 calories if you ate BSF larvae directly – or half of that if converted into fish, with a 2:1 feed conversion ratio. Chickens and redworms: Chickens provide eggs. If we set up redworm composting under them, how much of a chicken’s diet can be provided from worms that feed on chicken droppings? 5 eggs from our 5-chicken cage are 400 calories. Aerated compost tea: Biological pest control includes spraying compost tea – a brew of beneficial microbes, fungi, and protozoa – on growing plants. We will build a 55 gallon compost tea maker in this workshop. Together with beneficial insects, banker plants that attract insects, companion plants, and hedgehogs for slugs and snails – we will manage various pests without chemical sprays. Biotope: This is planned for the future as an important addition to the ecology of housing, but will not be built during the workshop. This is a structure outside of the greenhouse that attracts beneficial animals: wasps, frogs, snakes, bats, and bees. Bats eat large quantities of insects, and deposit them for us in the form of a fertilizer: bat guano. The bees collect nectar from miles around. Using biological bee keeping methods (top bar hive), we can harvest honey by opening the beehive once per year. Average honey crop is 40 lb, so about 1/10 lb per day – 150 calories per day! The important thing about bees is also that bee pollen could be collected, which is a superfood just like Spirulina. Our system will produces 2850 calories per day from fish, chicken, spirulina, mushroom, and BSF – not counting any of the vegetable crops – which is enough food for a complete diet for one person. This does not include any of the ve. This is not counting any of the vegetables and fruits in the growing beds and towers! Combined with the system outside the greenhouse – a chestnut grove, hazelnuts, edible landscape, and outdoor raised beds – there is the opportunity for a house that produces all the food for its inhabitants even on the scale of an urban 1/4 acre lot. 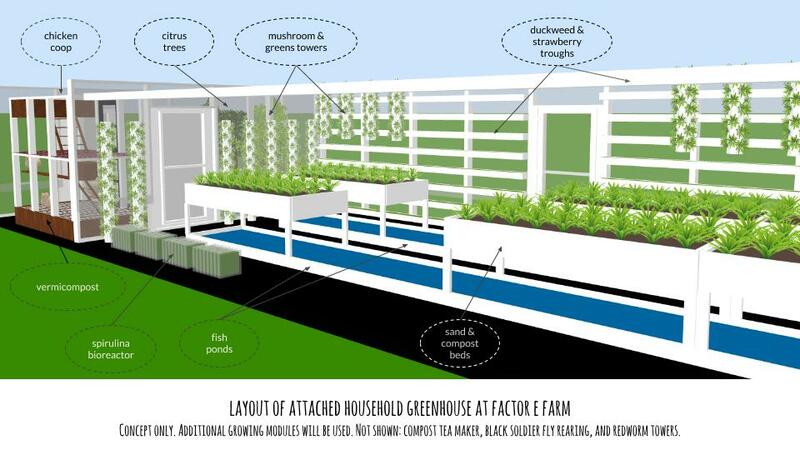 The goal of OSE’s integrated aquaponic greenhouse build is to demonstrate the limits of what can be produced by a smart, affordable, and practical design. We are optimizing for minimum inputs. What fraction of calories, and what fraction of nutrition – can an 800 square foot greenhouse provide in practice? We will engage in a 1 year personal experiment to determine how much is possible and practical. We will document the progress and the challenges encountered to determine a practical limit. If we limit allowable maintenance time to 15 minutes per person per day – can we achieve the full system as described? Workshop immersion involves concept and practice, and includes a crash course in carpentry skills. Participants become engaged in a part of OSE’s development process, where we produce open source blueprints for the infrastructures of civilization. Participants are introduced to basic principles of collaborative literacy – how the collaborative mindset can be used to solve wicked problems. This workshop is intended for people interested in immersion, hands-on skills training and practical results. This immersion course may be especially useful to people who would like to master their own livelihood as responsible stewards of the land. We are especially seeking participants with an entrepreneurial mindset to expand open source aquaponics into the mainstream of home food production. We are inviting those individuals who are interested in learning about aquaponics, and those who are considering aquaponics greenhouses or local food production as a business. We are explicitly calling out social entrepreneurs interested in starting open source aquaponics enterprises, where the collaborative efforts of many enterprises contribute to a constantly improving enterprise ecosystem. 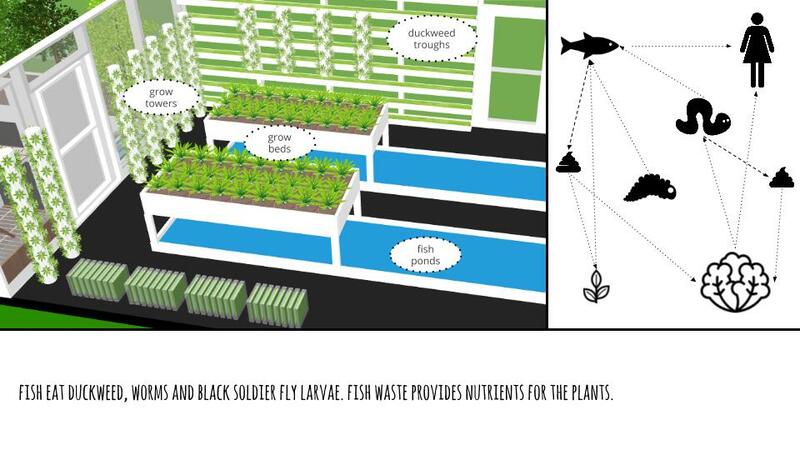 Because the aquaponics greenhouse is complex in terms of many moving parts, we think that open source collaboration is necessary for the improvements needed to make ecological aquaponics systems robust and productive – while using integrated pest management and local resources as much as possible. To help spread this work, we are also inviting dedicated documenters and videographers to participate in the event – email us to discuss the requirements. Aquaponic Greenhouse Structure (Nov 6-8): Extreme Build of a 800 square foot greenhouse with pond over a weekend. 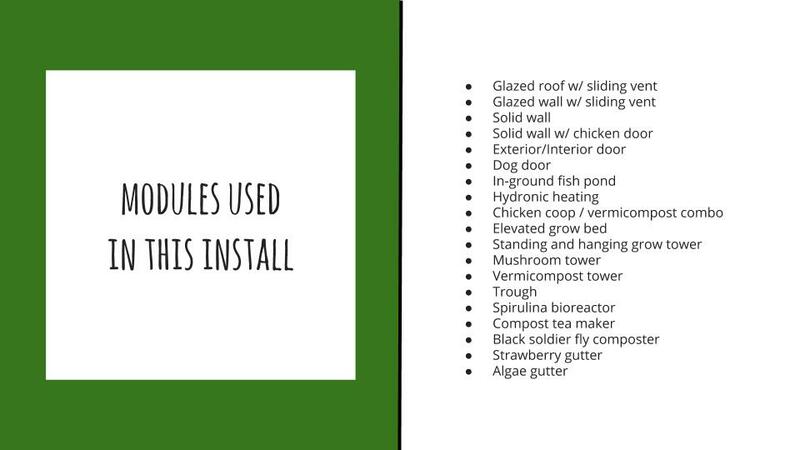 Integrated Biological Systems (Nov 9-11): Build and install the biological systems: plants, fish, mushrooms, spirulina bioreactor, chickens, redworms, black soldier fly larvae, duckweed, and heat-producing compost, and compost tea production. Both Workshops (Nov 6-11): Complete 6 day workshop – both the Structure and Biological Systems of the aquaponic greenhouse. Marcin Jakubowski – Marcin was trained as a fusion physicist. He left academia right after finishing his Ph.D. to start a farm – in Missouri. For the last 7 years, he has been working on the Global Village Construction Set – a set of enabling tools and machines for building regenerative infrastructures. Marcin is passionate about creating the Open Source Economy – a new operating system for Earth. See Marcin’s bio. Catarina Mota – Catarina is co-founder of Open Materials (do-it-yourself smart materials), Everywhere Tech (open source technology transfer), and AltLab (Lisbon’s hackerspace). Catarina recently finished her PhD dissertation on open and collaborative practices for the development of physical goods and technologies. She is currently a Research Chair at the Open Source Hardware Association and a TED Fellow. Previously, she co-chaired the Open Hardware Summit 2012, served on the board of directors of the Open Source Hardware Association, taught as an adjunct faculty member at ITP-NYU, and was a fellow of the National Science and Technology Foundation of Portugal. Catarina’s new initiative is the Open Building Institute, with a mission to bring affordable, open source construction to the world. Peter McCoy A self-taught mycologist with over 14 years of accumulated study and experience, Peter is an original founder of Radical Mycology, a grassroots organization and open-source movement that teaches the skills needed to work with mushrooms and other fungi for personal, societal, and ecological resilience. Peter is the lead cultivation expert for the Amazon Mycorenewal Project and Open Source Ecology. Apart from his work with fungi, he is also a community organizer, street medic, zinester, artist, musician, lecturer, and teacher. We will have the following sessions in the form of teleconference live feed. Ron Whitehurst Ron is a pioneer in Ecologically-Based Pest Management, and a principal at Rincon-Vitova Insectaries. Rincon-Vitova has pioneered the use of biological controls in the 1960s, and remains a leader in the field. Ron has been involved with organic methods for almost 30 years, and his book, Reading Weeds as Soil Indicators is a database in need of some updating but still ahead of its time. Ron will cover the basic principles of integrated pest management (IPM), and the specific best practices for pest management for the 15 crops of OSE’s aquaponic greenhouse. 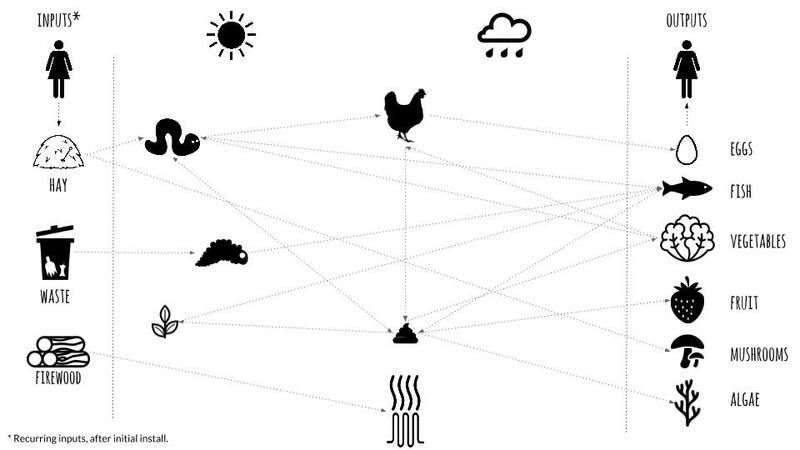 Design of tillapia rearing, growing, and harvesting system. Inoculation of ponds and starting of fish growing in tanks. Integrated pest management design and install for the 15 crops of the greenhouse. 8:30-12: Building and installing Roof Modules. 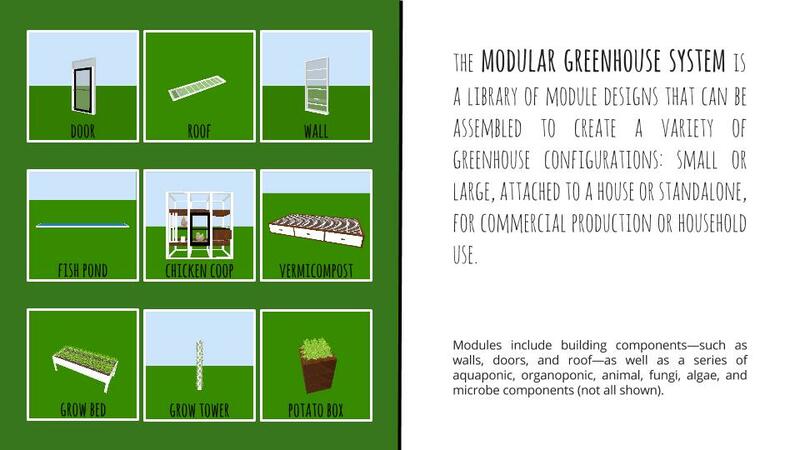 Learn how to build biological modules for an integrated Aquaponics Food and Heat Producing Greenhouse. *Early Bird Admission ends on Friday, October 16, at 7 PM CST USA time . The registration goes up by $50 after that. Sponsor another participant: Sponsor $300 or $500 to fund attendance of someone who is on the waiting list for financial assistance by making a donation. Discounts for Students and Low Income Individuals: If you are a student or in need, your cost is 50% off for any of the options. If this is still beyond your means, we can consider Work Exchange, where you stay an extra day to help with site preparation and cleanup. You pay a deep discounted rate. Email us for details. Early Bird 2-for-1 Discounts: Bring a family member or friend with you for free. 2-for-1 discount ends on Friday, October 16, at 7 PM CST USA time. Group Rate: If you can bring a group of 3 or more people including you – we can give you a discount. Email us for details. Workshop fee includes workshop tuition. We can pick you up from the airport, Kansas City International (about an hour away). Participants may secure a hotel in Cameron, Missouri, (15 miles away). We have 18 spots for participants who want to stay in our shared dorm room accommodations. We also have primitive camping on site which includes a composting toilet. Showers and a bathroom are located in our main house, HabLab. Meals will be done as a combination of catered dinner and potluck lunch. For lunch – bring your own or bring some to share. OSE will provide continental breakfast make-your-own sandwiches for lunch, and catered dinner. A kitchen is available for basic food preparation. Our accommodations are rough, so if you want a more comfortable stay, we recommend that you get a hotel. Our dorm rooms may be noisy due to late night conversations by participants. Please remember that we are an experimental facility that is permanently under construction, so please gauge your expectations accordingly. Registration for the choices above is found on Eventbrite, but Eventbrite accepts only PayPal or Credit Card. If you would like to pay by other means you can select that option at Eventbrite, but then you have to submit your payment independently of Eventbrite. We accept Dwolla, Bitcoin, Check, Money Order, or Cash. Your registration is complete upon receipt of payment. If you pay with Dwolla – Dwolla charges lower transaction costs than PayPal. If you are paying by Dwolla, register at Eventbrite and select the Dwolla option, then pay independently via Dwolla (Dwolla is not currently integrated into Eventbrite). Use Open Source Ecology or ops@opensourceecology.org as the Dwolla recipient. Bitcoin is a decentralized payment system. You can pay via a bitcoin amount translated by the current bitcoin exchange rate on the day that you register. OSE’s Bitcoin Address is 166yC48RakrZdtsBj36vY9q29CpzknHbxY. If you are paying by check, please make checks payable to Open Source Ecology. Our mailing address is OSE, 909 SW Willow Rd, Maysville, MO 64469. For mailings, please write “Aquaponics Workshop” along with number of days on your instrument of payment. Please use the the Eventbrite form below to pay with PayPal/credit card. Eventbrite charges a 6% fee on top of the ticket price. To select the 2-for-1 option that is valid until October 16, 2015 – register below as you would for any workshop option and email us at ops at opensourceecology dot org to let us know the name of the person that you will be bringing. Email us if you have any questions. This looks brilliant. Any thoughts on how this system would fair in Canada? Any chance of you doing a workshop in Canada? I am on ODSP (disability) due to chronic pain and have started growing my own food so I know what I am eating (no chemicals), using healthy food to, hopefully one day, reduce my pain to manageable levels. Due to our winters (and in part because I am still a gardening novice) I still have to resort to buying food at the grocery store for part of the year and to supplement what I cannot grow myself. I have been looking into building a greenhouse and a chicken coop to help resolve these issues; ODSP isn’t much and I want to be self-sufficient as much as possible. Aside from the price and trying to get it built, your aquaponic greenhouse seems like the perfect solution. I am inspired. I think this is an excellent initiative. Will you be doing the same course any time next year? Hi, is there a book or PDF availible for purchase in order to see how to build such a thing and where to buy what etc.? Is there an European Version for Austria? Thanks, Hagen.